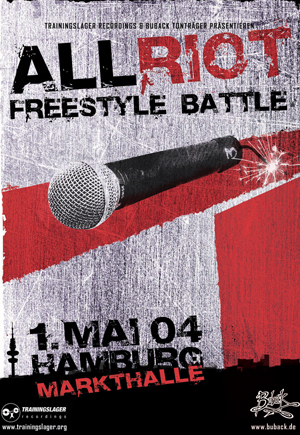 Freestyle battle live-recording in Hamburg – Markthalle 1. May 2004, hosted by Trainingslager Recordings. Uncensored 1:1 battle – the winner takes it all and the others gehen leer aus. Allriot! Live-Mitschnitt des Freestyle Battle in der Markthalle in Hamburg am 01. Mai 2004. Im Ring stand die bundesweite Champions League der verbalen Improvisation, präsentiert von Trainingslager Recordings. Keine Trostpreise und erst recht keine Gnade- the winner takes it all and the others gehen leer aus. Allriot!